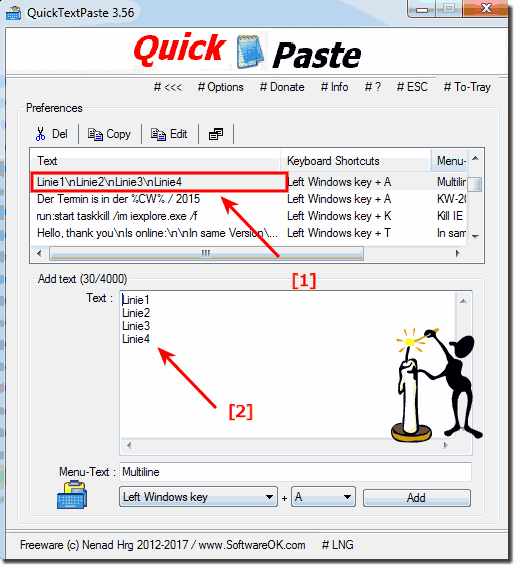 New Line in Quick text Paste %nc% BugFix resolved from Version 3.59! In the text edit field (... see Image-1 Arrow-2) please use the KEY enter for a new row ergo line! (Image-1) New Line in Quick text Paste! (Image-2) New Line BUG in Quick text Paste! How do I automate the insertion of text by keyboard shortcut under Windows I do not want to have to tap so much, especially with texts and words I use under Windows over and over again, I imagine myself as a secretary who has to enter stupid texts again and again I'm looking for a program that helps me here, I hope I do not have to type in the future so many texts are the repetitions and my fingers are somewhat spared?